Meeting compliance regulations for managing encryption keys is a challenge for IBM i administrators. Understanding the core concepts presented in this white paper can prevent a variety of problems, including unintentional compliance failures, poor risk management, and unexpected breach notification events. 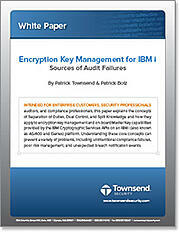 Download the white paper "Encryption Key Management for IBM i - Sources of Audit Failures" by completing the form at the right.